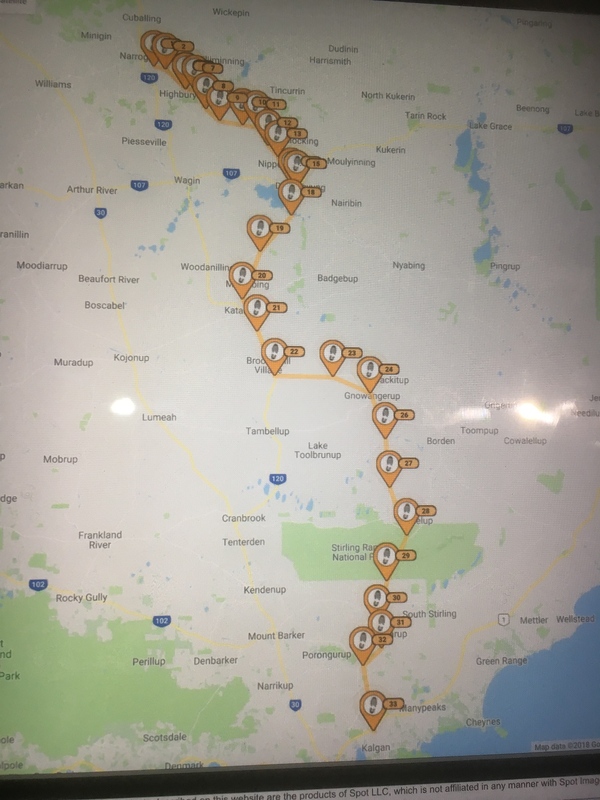 I will be departing my place at 0700hrs Saturday, travelling along Albany Hwy to North Bannister, turning east onto the Wandering-Pingelly Road, then into Narrogin. Total distance 190k. Anyone else want to join let me know. Thanks Jeff. I will SMS you my details. See you Saturday. I'll be travelling down Saturday morning via the Gt Southern Hwy. See you all 10am. For all the guys taking the Long Way Down to Jeffs new digs, Have a great and safe ride, Enjoy yourselves and watch out for Emus and Roo's. BillB's spot tracker of the ride. A group left Perth at 7am Saturday and rendezvoused with others that travelled to Narrogin on Friday arvo to meet with event co-ordination Jeff Douglas and his wife Sandy. The first stage ended in Dumbleyung with all the route on dirt farm tracks and roads. The next stage was Gnowangerup then more dirt roads thru the Stirling Ranges to Jeffs farm near the Kalgan river arriving as the sun set at about 6.15pm a 11 hour day of riding. Glowing reports continue to come in about JeffD's Long Way Down (to the Farm) Ride. There was the bonfire. No more glowing than that. The bonfire proved to be a great focal point on the unusually warm night in the Albany surrounds. Among the topics of conversation was a continuing reference to 'Bleep the Sheep', an old family pet. I woke up to a cold (at last!) Monday morning and, accompanied by a few light showers, zapped back to work. Feasted on sausage roll, minced meat pie and coffee at the Williams Woolshed. Good stop-over point. The weather stayed blissfully cold until I started the descent into Perth, when the temperature soared. I was incredibly overdressed for such high temps and surely lost a kilo or two before reaching the hill. Hey Nev, thanks for the story, the photos - and the tractor driving. To all of the riders who took a chance on an unproven ride leader ( a ride leader who brought with him a different navigation regime) and headed down the dirt roads to a largely unknown destination, thank you for your courage and enthusiasm. It was very satisfying to see such a strong turnout for our ride and interacting with you all throughout the day and evening made the planning very worthwhile. See you all at Catalanos before long. Dinner and breakfast all banged up in that tiny shack!